Roasted Pistachios There are 3 products. Best quality product from the house of Tulsi. 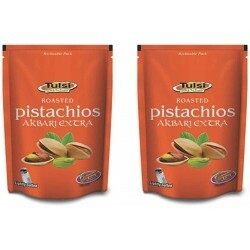 Its large shape is distinctive from other pistachio kinds. Delicious crispy taste and lightly salted to keep the sodium low. Good source of copper, magnesium, potassium, vitamins. Excellent sources of vitamin-E, B-complex groups of vitamins. Storage Information- Store in a cool and dry place.